Closed cycle paths, cycle paths that are no more than paint on the sidewalk, diagonal road crossings, temporary traffic lights standing in a concrete filled old oil drum, road dividers in concrete, steel or red and white plastic, temporary bridges, temporary bicycle parking racks... Cycling in a city that doubles as a huge building site is quite an adventure! all the other road infrastructure on the picture is temporary too. 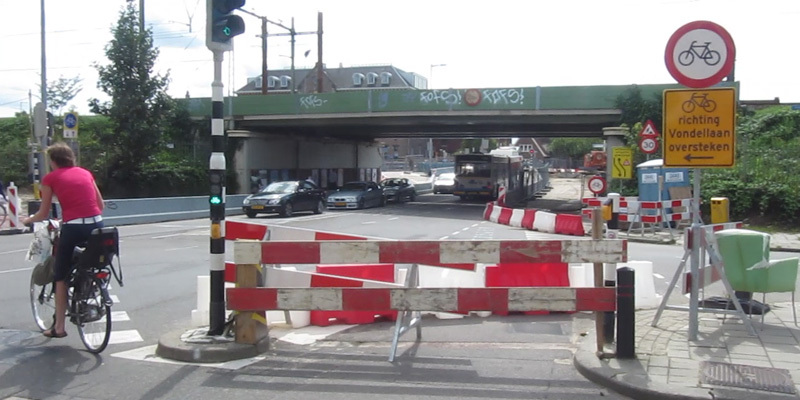 The city of Utrecht is rebuilding its 1970s railway station area. Utrecht Central Station is the Netherlands' biggest railway station since it is located in the center of the country at a point where five major railway lines come together. It now sees 65 million travellers per year and that is expected to rise to 100 million in 2020. The 1970s station and the whole area around it just couldn't handle everything anymore. Building in the area has started a couple of years ago and the last of the 25 huge interconnected projects will only be finished in 2030! 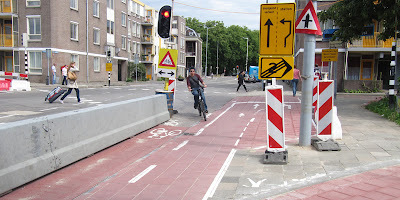 Since it is a vast area a lot of cycling routes go right through it. 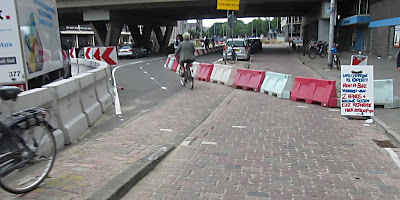 While the building goes on we see a lot of detours and temporary cycling infrastructure. 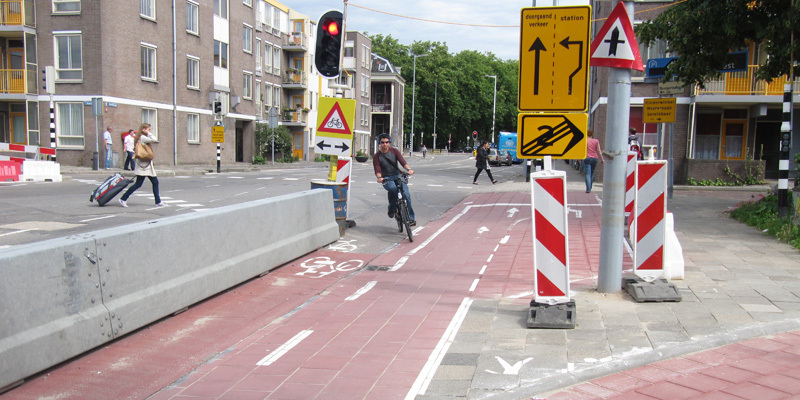 Many of which sure doesn't meet the normal criteria for standard Dutch cycling infrastructure. But at least it is there, and it does seem to be able to handle the large volumes of cycling traffic that this area sees. Below some stills from the video at the bottom. 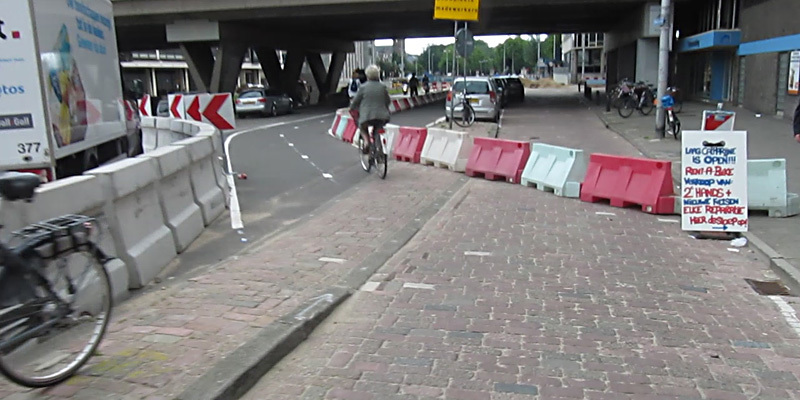 Cycle path closed, a diagonal crossing brings cyclists to the temporary cycle path on the other side of the street. The kerb (curb) with the arrow should also have been leveled, just like the ones to the right of it. Boys will be boys! 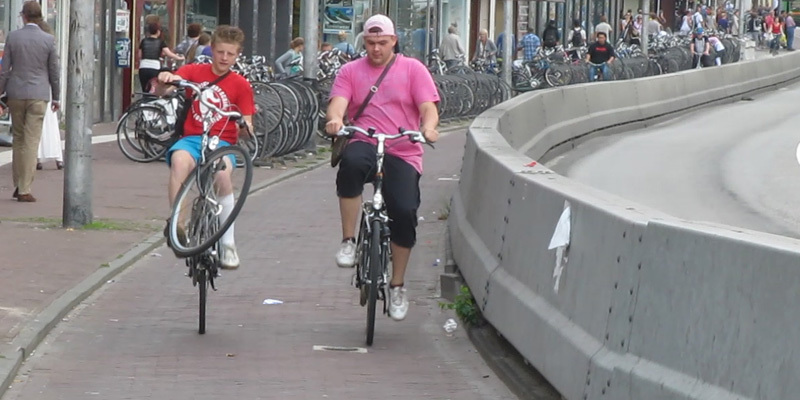 Protected from buses by the steel divider this boy thought a wheely wouldn't be a problem. Concrete dividers and a painted cycle lane. 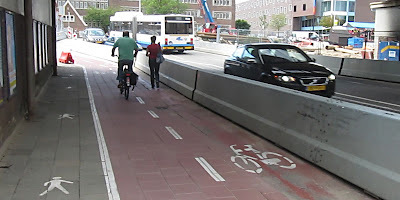 Only acceptable as temporary cycling infrastructure. The station area in the city of Utrecht will remain an interesting place to use your bicycle in the coming years. Paths will be relocated every time the builders need them to be somewhere else. But at least they do create temporary cycling provisions. I have not seen a 'cyclists dismount' sign, at least not yet, but I don't expect we'll be seeing one either. 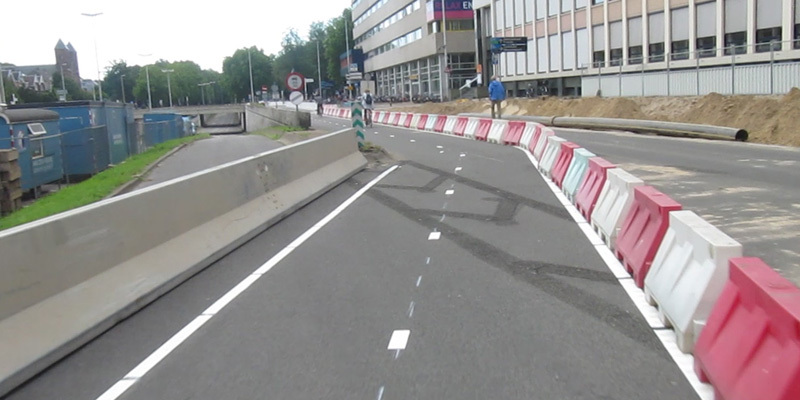 Once a freeway entrance, now a temporary cycle path. Paint hardly ever works... she didn't get where she had to walk. The video gives you a feel of the area as it is now. Not perfect for cycling but it is quite all right. The video has a Japanese flavoured surprise at the end. 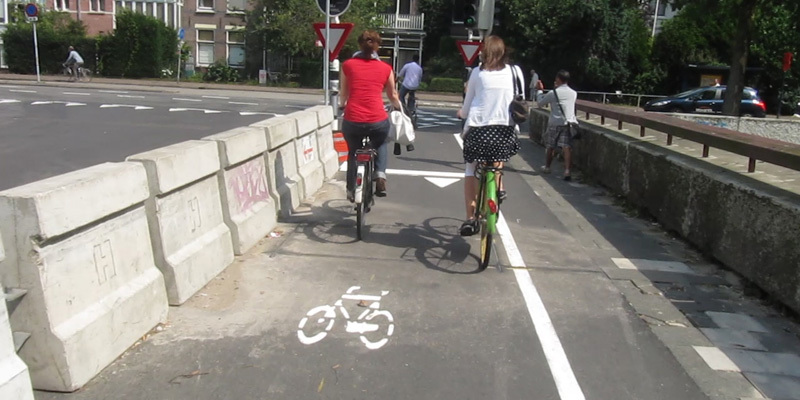 See many other examples of how building and road works do not need to inconvenience cyclists. The urban redevelopment project is not only about building the new station or 'Public Transport-Terminal' for trains, trams and buses, it is also about redesigning the shopping mall and building theaters, cinemas, hotels and a new council office. All the streets in the area will be redeveloped for the changed traffic flows and the historic city moat (that was turned into a motorway in the 1960s) will return to the city. There is an elaborate -even in English- website for this mega-project. The information video gives you a quick and good overview of the size of this project. They may be a temporary bodge, but they're still better than the permanent "designs" that we have in Britain. Have you seen this on Blackfriars Bridge BTW? A cyclists dismount sign on a road open to motor traffic! Bloody pathetic - never mind, lane rental will sort it all out so you won't get held up by road works and can keep driving everywhere. It works by making people who do stuff, like TfL, pay someone (like, erm, TfL) to dig up roads. Great film, Mark. I even recognise some of those paths from our recent trip! In Australia the construction would simply close the cycle path - not that we have many. The busier, key cycle routes do remain open but only because there would be an uproar if they did not. Another reason why we need more bicyclists and better infrastructure - it builds demand and public support. Today on my way home from work I was riding on the footpath for a small section (legal in Queensland) of busy, dual lane road. Construction equipment had blocked the ENTIRE footpath and they were not providing a safe way for pedestrians to continue their journey - yet 4 lanes of car traffic remained open... it's sad. The best cycle path in Britain ?